A little over 3 inches here and just had a nice shower. First time I've seen teens in awhile too (18.8). You guys are looking real good for Sunday into Monday. Way more difficult to find ways to screw this up as oppossed to make it happen. 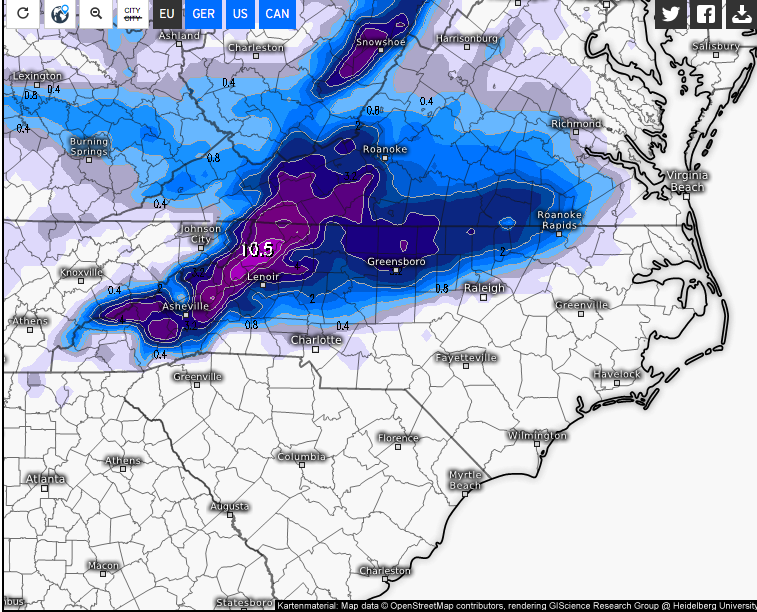 The GFS is looking less and less promising for Asheville for Sunday night snow. Joe and Buckethead and north to all our northern mtn friends still look good in my opinion. Hopefully, the models blow up a big storm today that crush the mtns and foothills, but I am not holding my breath. I did see that. Hopefully, it is correct. Maybe today will produce more positivity for me. 0z Euro has a similar solution to the 6z NAM. Drops around 4” at KAVL as the 5h vort rotates through. Hopefully, models go the way of the NAM and the Euro today. Actually, hopefully, the weather goes the way of the NAM and the Euro. Yea that 06Z NAM solution was a doozy, with near 9" of snowfall at KAVL through Monday morning. I was just talking to a colleague and again we use this "rule" over and over - if the NAM and Euro are in agreement, then a blend of their solutions is the likely outcome. Hmm....GFS....you're move. Today will be the day of reckoning, definitely by 0z tonight. All the pieces to the puzzle will be well sampled and loaded in. I anticipate that at some point,mist likely 0z tonight hopefully right after Duke beats unc, the gfs will fall in line, adjust. RNK: "Enormous uncertainty in winter weather potential this weekend." GSP: "The short term is a complicated mess"
Whoever wrote the GSP disco this morning is a gifted writer. start at the beginning, and when you get to the end, stop). Rockies, while cyclogenesis is underway across the Southern Plains. during the day (starting off with a little snow in the mountains). increasing across the Deep South into the Southern Appalachians. least moderate to at times fairly significant amounts of snowfall. out for any details at this time. afternoon, with just some lingering NW flow snow in the mountains. I remember the old e-e rule when it was the eta. I hope it still holds. 12z euro clobbers the northern mountains. It looks good for a good portion of NC. Hope it’s right. About dang time.... anyways just got back from Florida this morning from a booze filled vacation. Guess if it's gonna snow in march, might as well be a good one. Bring it on. I'll take the Euro and call it a winter. Anybody got any details from the Euro? Time frame, amounts, temps? Timeframe someone else may have to elaborate on given the dynamics and changeover potential, but the Euro painted 10-12 in across the N mts. where is the cold high pressure when you need one, was hoping this storm would have the cold air with it. FOR SUNDAY NIGHT, AS THE MILLER-A LOW SHAPES UP, LOW-LEVEL CAA WILL PICK UP ESPECIALLY ACROSS THE MOUNTAINS, AND IT'LL BE A BIT OF A RACE TO SEE HOW FAR INTO THE PIEDMONT THE COLD AIR SPREADS BEFORE THE DEEP MOISTURE EXITS. ONE THING WE CAN BE FAIRLY CERTAIN OF IS THAT THIS IS A PRETTY GOOD SETUP FOR DECENT ACCUMULATING SNOW IN THE MOUNTAINS, ESPECIALLY AS THE COLD AIR REALLY PUSHES IN ALOFT. THE COLDER THE AIRMASS, THE HIGHER THE SNOW RATIOS GO, BUT ACROSS ESPECIALLY THE NORTHERN MOUNTAINS IT LOOKS LIKE IT MIGHT AVERAGE OUT AROUND 12:1 OR SO. AS THE MOISTURE WITH THE UPPER LOW RAMS INTO THE APPALACHIANS, THIS IS WHEN WE COULD REALLY SEE SOME SNOWFALL TOTALS PILING UP AT THE HIGHER ELEVATIONS, ESPECIALLY AS WE PUSH TOWARD DAYBREAK MONDAY. CURRENT QPF AND EXPECTED INCREASING SNOW RATIOS LEAD TO SOME HEFTY AMOUNTS, AND GIVEN THE UNCERTAINTY IN EXACT QPF HAVE TONED THIS DOWN A LITTLE, BUT IN GENERAL HAVE ENOUGH CONFIDENCE TO ASSUME WE'LL LIKELY HAVE WARNING CRITERIA *AT LEAST* ACROSS THE NORTHERN THREE, AND POSSIBLY FARTHER SW ALONG THE TN LINE INTO THE SMOKIES. FOR NOW, HAVE OPTED TO GO AHEAD AND ISSUE A WINTER STORM WATCH FOR YANCEY/MITCHELL/AVERY; GENERALLY THE 4" CRITERION SHOULD BE MET (WITH THE CURRENT FORECAST) LOOKS LIKE ABOVE 3KFT, BUT ONCE YOU GET UP TO 5KFT AND HIGHER, WOULD NOT BE A BIT SURPRISED IF WE END UP SEEING SOME TOTALS APPROACHING OR EVEN EXCEEDING A FOOT. HAVE KEPT THE HIGHEST AMOUNTS ABOUT 9-10" AND THAT'S PRETTY ISOLATED. LATER SHIFTS WILL HAVE TO REEVALUATE POTENTIAL ACROSS THE SMOKIES (ESPECIALLY GIVEN THE NUTTY NAM WHICH IS PAINTING >15" THERE). WOULD LIKE TO NOTE THAT THE WATCH WILL BE IN EFFECT FROM 00Z-18Z MONDAY; BY ISSUING TODAY IT'LL BE ISSUED IN EST BUT VALID DURING EDT SUNDAY NIGHT SO A LITTLE DST CONFUSION THROWN IN THERE WITH THE REST OF THE MESS. AS FOR THE PIEDMONT, OF COURSE THE NC PIEDMONT HAS THE BEST CHANCES OF SEEING ACCUMULATING SNOW, BUT THOUGH 850-700MB THICKNESSES WILL BE COLD ENOUGH, SURFACE TEMPS AND LOW-LEVEL THICKNESSES JUST DON'T CUT IT FOR MUCH IN THE WAY OF ACCUMULATION. CURRENT FORECAST REMAINS PRETTY CLOSE TO WHAT WE'VE BEEN ADVERTISING. AS WE MOVE INTO MONDAY AND MONDAY NIGHT, AT THIS POINT IT JUST SORT OF DEPENDS ON IF THE MOISTURE WITH THE UPPER LOW GETS ALL SNOWED OUT IN THE MOUNTAINS OR IF THERE'S ENOUGH TO BREAK CONTAINMENT AND SPREAD INTO THE PIEDMONT; GFS MOST EXCITED ABOUT THIS BUT LOOKS A LITTLE OVERDONE FOR NOW. TYPICAL POST-CAD/POST-COLDFRONTAL TEMPERATURES MONDAY SHOULD BE PRETTY SIMILAR TO IN-CAD/PRE-COLDFRONTAL TEMPS ON SUNDAY, AND AT OR BELOW FREEZING EVERYWHERE FOR MONDAY NIGHT, SO UNLESS THE DRIER AIRMASS MOVING IN COMBINED WITH WINDS STRONG ENOUGH TO DRY THE AREA OUT (CERTAINLY MIGHT BE), WE COULD SEE SOME BLACK ICE ISSUES ON TUESDAY MORNING. 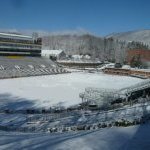 Surprised there isn't more chatter on here, GSP says there could be significant snow in the valleys and foothills once the snow levels start dropping Sunday evening that things are still up in the air at the moment on storm totals even for Asheville. I think if the storm would move about 50 miles south a lot of folks would be in for a good snow event. with the highest amounts in the northern mountains. above 5000 feet, are possible. * WHERE...Avery, Yancey and Mitchell Counties. * WHEN...From Sunday evening through Monday afternoon. Feels good to finally be in the proverbial bullseye for a system. Here's hoping for an overperformer. I've still never seen a foot of snow in my yard. Crossing my fingers really hard we can get there this time with the ULL/deformation band. A little thundersnow to boot wouldn't be bad either. I'm not feeling too confident on this one. I want to but deep down I think we're going to be rain a bit longer than expected. Models are beginning to move north again. I think it'll be very elevation dependent south of Avery County. Usually, in these types of events, it's very hard to get cold air in here before you've wasted most of the moisture. Avery north seems to cool down much quicker. Many March storms have given Boone a good thump while my county and south gets practically nothing. We'll see.